"My Old Kentucky Home" - Bardstown, Ky.
On June 1, 1792, two-hundred twenty years ago, Kentucky was admitted as the fifteenth state of these United States. The road to statehood was not easy. to the south and westward of a line beginning on the Ohio at the mouth of Great Sandy creek and running up the same and the main, or northeasterly, branch thereof to the Great Laurel Ridge of Cumberland Mountain, then south westerly along the said mountain to the line of North Carolina. The Virginia legislature divided the single Kentucky County into three (Fayette, Jefferson, and Lincoln) in 1780. Over the next six years, the number of counties in Virginia's "Kentucky District" grew. With them, so grew the rumblings of statehood. In 1784, at Danville, Kentuckians held their first constitutional convention. It would be the first of ten such conventions before Kentucky would gain admittance to the Union. A major hurdle -- acceptance by Virginia -- was overcome on December 18, 1789 when Virginia's legislature authorized Kentucky to apply for statehood. The tenth convention occurred in April of 1792. 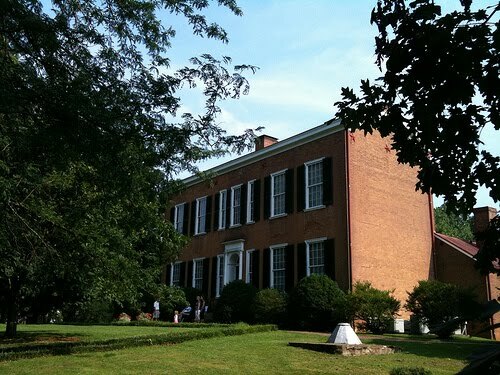 At Danville, forty-five delegates (five from each of Kentucky's nine counties) gathered including some of the greatest legal minds then in Kentucky. Among them, Col. George C. Nicholas who was the chief draftsman of the convention's final product. For his efforts, Nicholas is known as the "Father of the Kentucky Constitution." The produced document was certainly not perfect and it only remained in effect for seven years before a new Constitution was adopted in 1799. But the document was sufficient to meet the Congressional deadline. 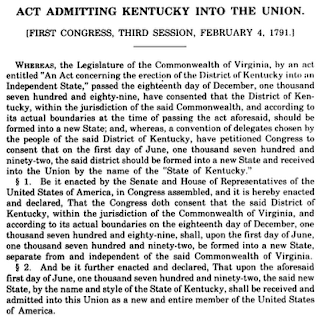 For on February 4, 1791, the third session of the First Congress passed the "Act Admitting Kentucky into the Union." Read that "the said district should be formed into a new State an received into the Union by the name of the 'State of Kentucky.' 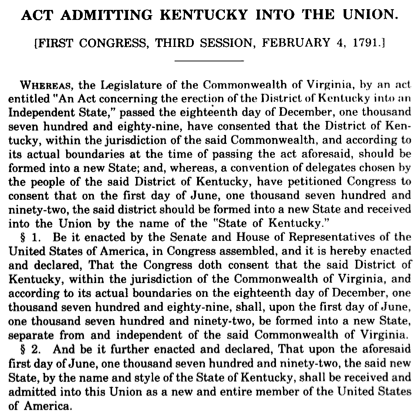 ... [and] that upon the aforesaid first day of June, one thousand seven hundred and ninety-two, the said new State, by the name and style of the State of Kentucky, shall be received and admitted into this Union as a new and entire member of the United States of America." Happy Birthday, Kentucky! Help us celebrate and let's get #HappyBirthdayKentucky trending on twitter. If you have a twitter account, use that hashtag!